Apple to Cut iPhone 3GS Price to Free With Next Update? With talk of Apple seeking to release a cheaper iPhone being revived in recent days, RBC Capital Markets analyst Mike Abramsky now weighs in to report that he believes that Apple will be keeping the iPhone 3GS around even after the next iPhone hardware update, offering the device for free with a two-year contract and at $399 for unsubsidized purchases. Apple currently sells an 8 GB iPhone 3GS for $49 on a two-year contract and $449 unsubsidized. As its entry-level iPhone strategy, Apple is expected to cut iPhone 3GS to $0 (on contract, $399 unsubsidized) in conjunction with iPhone 5 launch (we continue to expect it in September). This approach is intended to target mid-market smartphone buyers and counter Android's mid-market expansion. We expect iPhone 5 to launch at $199/$299 ($599/$699 unsubsidized), and Apple to drop iPhone 4 pricing to $99 ($499 unsubsidized). 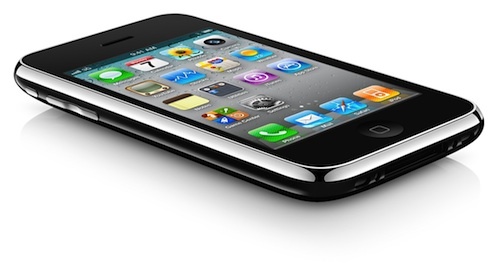 The claimed $399 price point for the unsubsidized iPhone 3GS is a bit higher than other reports have been hinting at, with the analyst report from earlier this week suggesting that Apple would try to come in at $349 for its cheaper iPhone. Earlier reports had claimed that Apple was working on a smaller iPhone form factor that could allow the company to offer the device for as little as $200 unsubsidized. But while some rumblings of a new, smaller iPhone option for this year continue to float around, Abramsky believes that the "baby iPhone" will not be released until 2012, in part to fully take advantage of iCloud leverage that may not be possible as the service debuts. In Europe, mainly countries like the UK (and even Canada ... yes I am aware that is not in Europe) get the iPhone 4 for dirt cheap or even free provided you sign a contract. Carriers in the US are very greedy. Really? Is anyone going to get a phone that is soon to be 3 generations old? My 3GS is getting tired and i'm sure iOS 5 isn't going to help. I can't wait to palm it off on the sister-in-law. Americans are getting ripped off so bad. I can see keeping the 3GS for emerging markets, but I would prefer a stripped down version of current tech, rather than something that is 3 years old. If this report is true, it looks like I still won't be buying an iPhone and will have to make do with my Android. Link? optus.com.au telstra.com.au vodafone.com.au three.com.au and any other australian telecom company. we are always able to get the iphone free with 2 year contract even from day 1. There are a bunch of costs associated with having so many different product lines going at the same time. You'd either have to tool up another assembly line to do the model, or do a production run of your lowest expected volume model and then retool and switch models, which would leave inventory lying around, and we know how much Tim Cook likes inventory (http://money.cnn.com/2009/01/15/technology/cook_apple.fortune/index.htm). Inventory, Cook has said, is "fundamentally evil," and he has been known to observe that it declines in value by 1% to 2% a week in normal times, faster in tough times like the present. I expect Apple to stick to their previous-model and latest-model strategy and not complicate things any more than needed. If we're living in the past, then you must see no value in the internet, or Macrumors for that matter. Very little innovation comes out of Europe anymore. If you don't see that, you're just ignorant. Apple, Intel, AMD, Microsoft (when the copier isn't running), and Google (them too) are the main sources of innovation, at least in the tech world, and they're all American-based. Europe needs to get its act together. You guys lost John Ive all those many years ago, and for good reason. Europe is the biggest vehicle export region in the world. Most vehicle innovation in terms of tech and fuel economy originates in Europe. If you think America is the only innovative country left, you're.. well, to backfire just ignorant. - Essential for markets where pre-paid/post-paid plans are very popular. Among best examples would be markets like: India, China, Malaysia, etc. I belong to India and I'm aware that almost every person who buys a phone is on a post-paid [per monthly] or a pre-paid plan. But both these plans do not include the cost of the phone. You've got to buy the phone yourself. $350 sounds like a great price for such a market. - Lets be honest: not everyone affords an iPhone. I used to have an iPhone but at present I use Mozart7. I got a couple of Trophy7s for mom and my aunt. - Not everybody carries an expensive phone. If I were to gift a phone to my little brother or probably my girlfriend, I'd buy a cheaper - non-iPhone model. If a cheaper option was there, I wouldn't have been bothered at all. iPhone has to become cheap overtime if Apple needs to take care of some more people. They are going good with whatever they have but if they need to aggressively compete, they need a cheaper iPhone. Not the most reasonable price, but we shouldn't forget: this is Apple! Apple has divulged plans to relaunch its iPhone 3GS, which was then only available through network operators like Vodafone and Airtel. The new unlocked version will come with 8GB internal storage at a very reasonable price of 19,990 Indian rupees (about $444). Apples latest iOS version 4.3 supports iPhone 3GS, making it a worthy opponent to similarly-priced Android devices with better hardware. Apple has also said that iOS 5 will work on iPhone 3GS though it is likely that not all features will be supported. You conveniently forgot to mention that non only Mr Ive, but actually most of the innovative people working for those companies are not born Americans but imported foreigners - and that too for good reason. You also conveniently ignored that while the USA might be leading in the computer industry, at least when we're talking about software, other nations are leading in other industries. Just to give two examples, Germany is still the leading nation when it comes to the automobile industry and when your money is in bioengineering, you will make sure that you spend it in Asia. Oh, and ARM Ltd, the guys who actually design the CPU architecture that is used in your precious Apple iGadgets, are a British company and Apple is just one of their many licensees. And when you remove the Motorola group from the picture, you will quickly discover that America is not a real player at all in the telecommunications arena at all - a certain Finnish and several Asian companies dominate that market and even manufacture the hardware components used in the iGadgets. But you are right, the US of America still are a nation that pumps money into new products and new markets and new ideas while in Europe everybody is just too conservative for it or too scared to lose their investment. But when the bubble bursts and the American economy flushes down the drain, you get to understand why European money is invested more carefully. Meh, my iPhone 4 is free on a two year contract.